Nothing lined up properly, very disappointed with the product! Horrible contact. Took almost month. Is a 5 hour ride. No MAF sensor plate with this "kit" you have to purchase a separate adapter. I had to cut my fan shroud to fit. And still the bracket wont fit in the slot. I bought this for my 2001 5.3 Chevy suburban, when it arrived I was surprised at the build quality. Everything fit together well and fit in the truck perfectly except for the mass air flow sensor which required a bit of persuasion to get on(be careful with it though, one slip of the finger and the sensor is done) it helped my truck out quite a bit with throttle response and made it sound alot nicer in the higher rpm range, has mileage seems to have been increased aswell but only time will tell for that one. Over all I would recommend it and Will be buying one on any future truck I own. Installed on 2002 Silverado 1500 LT w/ 5.3 V8. 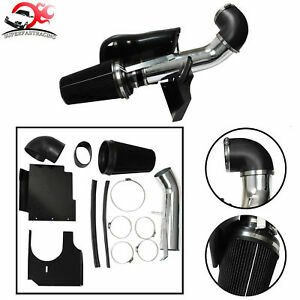 I was initially skeptical about this intake, as several reviews claimed that fitment was poor. I'm assuming these folks were either not very mechanically inclined, or perhaps they were attempting to install this on a vehicle for which is was not intended to be installed. Why do I say this? Well, the thing bolted up perfectly. There were absolutely no issues with the install what so ever. Every screw hole lined up, and every bracket went exactly where it was intended to go. Be patient and take your time with the install and it will work out perfectly. It immediately brought my old truck back to life; improving throttle response, and the sound of the engine as well. Many reviews of this intake claimed that this unit is on par with more expensive intakes on the market, and I believe that too. It was well worth what I paid for it. I gave it 5 stars because of the cheap price. No instructions but if you’ve ever installed a system before you should be fine. My complaints are the silicone adapter from the intake pipe to mass air flo sensor was straight and sensor smaller diameter but if you slowly snug down clamp it went on fine. The mounting bracket was too far away from the mount so I added a little extension. Other than that the rest was a cinch. I’ve installed expensive k&n Intakes and this was comparable. The slash guard fit better than some. If you want to get a CAI on your Silverado this is the way to go. Just check on resetting your ECU so it won’t be too lean. I noticed a huge difference in throttle response on my 5.3. Bought for a Chevy Tahoe & doesn’t fit at all . Waste of time .